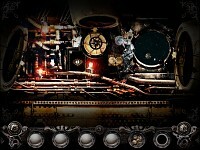 Steampunker is an award-winning point and click adventure game involving a search for hidden objects. It's set in an astonishing steampunk world. The adventures of Vincent, our hero, begin when evil robots attack the Earth. The game contains a series of puzzles linked together into a traditional "point and click" adventure story. We meet Vincent in a harbor, then he boards a submarine, travels to an island, flies to the Moon in a rocket and finally fights the robots in their spaceship. In order to complete the mission Vincent has to explore the world and find objects needed to fix the vehicles and move in his unique steampunk style world. The brain teasers include fighting a steam leakage, solving maths puzzles and many more. The game is simple and intuitive, naturally drawing the player into the main protagonist’s amazing world. Music and sound effects have been created by Silver Rocket which has also developed and recorded the concept-album "Tesla" about the iconic scientist. "unique hand-drawn graphics & original music." Welcome to the Players Choice, App of the Year Event, Congratulations to all the nominees for making it this far, Onwards to the celebration! Balloon is a side-scroll adventure puzzle game with funny characters, tight controls and a 16-bit retro style. Huerons is a challenging puzzle game that will make you think hard and long. Avoid is a frenetic, fast and challenging runner with a simple but well refined graphical style. It offers an addictive arcade gameplay in the spirit of old coin-op games. You play as a ship whose mission is to survive as long as possible dodging obstacles and enemies with the help of various power ups. All this while the background follows the music like a visualizer. Steampunker is a point-and-click adventure game for iPads. 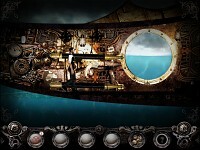 The game has unique hand-drawn steampunk graphics and original music. The adventures of Vincent, our hero, begin when evil robots attack the Earth. As a reward for your hard work, the winner will take home a one-of-a-kind memento, a IOTY pocket watch, acknowledging the time and hard work you have dedicated to your project and community. These were hand made by A E Williams Pewter specially for this event, you can also get your own custom loot (drinking horns, goblets, etc) made by them. Thank you for voting for Steampunker! Congratulations to all other TOP5 game developers! On Monday our Indiegogo campaign ended. We raised money needed for improving the existing iPad version and developing the iPhone and Android versions which will be available by the end of January. We also plan to release the PC and Mac versions in 2015 but there are no specific dates for them. Happy New Year to all the game developers and gamers community! Congratulations to all the others and specially to Steampunker! Is it possible to see the category winners?